Pictured here, me and Tom - partner in crime at Wire &Twine - standing inside of our first festival tent full of screen-printed goodness. Not pictured: many months of planning, a lot of power production by intern extraordinaire and tube-top rocker Garrett, plus sweat, tears, and a pile sawdust created by the whole crew. "enjoy this beautiful day" is a great msg for any chest. hope the T-booth sold hotcakes, and that you enjoyed that beautiful day. You never cease to amaze and impress! Love the shirts, will be sending some orders your way. Consider yourself linked, have live link now to your shop on my blog. 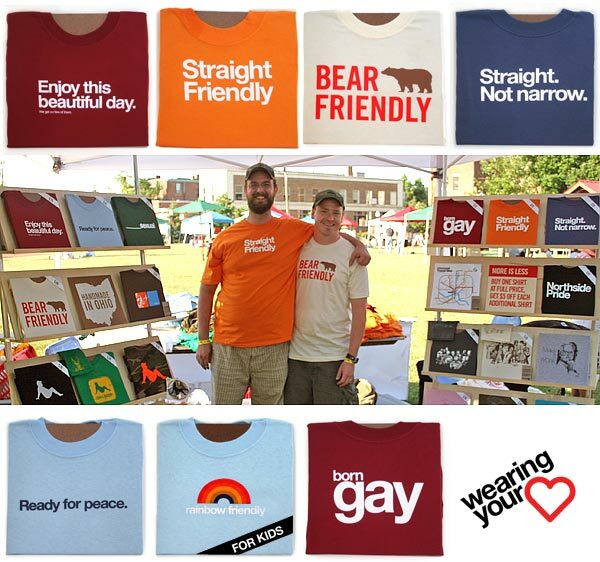 Always eager to help gay business owners with quality merchandise. is was great seeing you! we need to meet for lunch or something soon. We usually try to make the Pride festival, but things are crazy this weekend. Damn, I wish I'd known that you were going to be there. Congrats on the new booth, hope you had a great weekend!